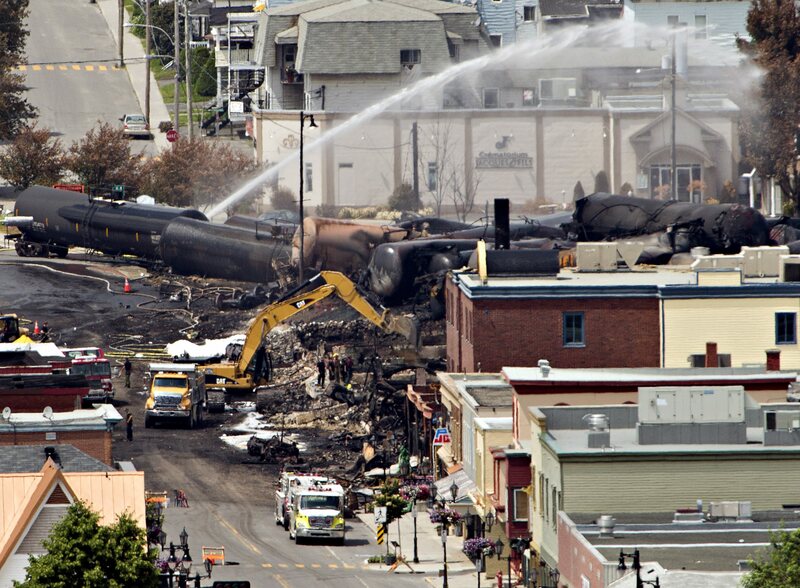 LAC-MEGANTIC, Quebec Investigators looking for the cause of a fiery oil train derailment are zeroing in on whether an earlier blaze on the same train may have set off a chain of events that led to the explosions that killed at least 13 people. Searchers, after days of delay, were examining the charred epicenter looking for what could be dozens of additional victims. Nearly 40 people are still missing, not counting the 13 unidentified victims, suggesting the death toll was likely to rise sharply. "The extent to which (the fire) played into the sequences of events is a focal point of our investigation," Ross said. All but one of the train's 73 cars were carrying oil. At least five of the train's tankers exploded after coming loose early Saturday, speeding downhill nearly seven miles (11 kilometers) and derailing into the town of Lac-Megantic, near the Maine border. Officials said Tuesday that the fire is finally under control and that 1,200 out of about 2,000 evacuees will be able to go back to their homes. The DOT-111 is a staple of the American freight rail fleet. But its flaws have been noted as far back as a 1991 safety study. Among other things, its steel shell is too thin to resist puncturing in accidents, which almost guarantees the car will tear open in an accident, potentially spilling cargo that could catch fire, explode or contaminate the environment. "It's too early to tell. There's a lot of factors involved," Ross said. "There's a lot of energy here. The train came down on a fairly significant grade for 6.8 miles (11 kilometers) before it came into the town and did all the destruction it did." He said the train was moving at 63 mph (101 kph) when it derailed. The president of the railway company, Montreal, Maine & Atlantic Railway, denied allegations his company has a spotty safety record. The Canadian Broadcasting Corporation questioned Edward Burkhardt about the train company's record of eight derailments and 10 spills since 2009 in a TV interview. Burkhardt said the company had only experienced a series of small incidents involving tracks in the past few years, and last Saturday was the only significant derialment. The Saturday blasts destroyed about 30 buildings, including a public library and Musi-Cafe, a popular bar that was filled with revelers, and forced about a third of the town's 6,000 residents from their homes. Much of the area where the bar once stood was burned to the ground. Burned-out car frames dotted the landscape. Maude Verrault, a waitress at downtown's Musi-Cafe, was outside smoking when she spotted the blazing train barreling toward her. "I've never seen a train moving so fast in my life, and I saw flames ... Then someone screamed 'the train is going to derail!' and that's when I ran," Verrault said. She said she felt the heat scorch her back as she ran from the explosion, but was too terrified to look back. The derailment raised questions about the safety of Canada's growing practice of transporting oil by train, and was sure to bolster arguments that a proposed oil pipeline running from Canada across the U.S. - one that Canadian officials badly want - would be safer. The train's owners, Montreal, Maine & Atlantic Railway, said they believed brake failure was to blame. Nantes Fire Chief Patrick Lambert said that when the same train caught fire hours prior to the accident, the engine was shut off per the standard operating procedure dictated by Montreal, Maine & Atlantic Railway. The blaze was extinguished within about 45 minutes. And that's where the fire department's involvement ended, Lambert said. "The people from MMA told us, 'That's great - the train is secure, there's no more fire, there's nothing anymore, there's no more danger,'" Lambert told reporters. "We were given our leave, and we left." Quebec's Environment Ministry Spokesman Eric Cardinal said officials remained hopeful they could contain more than 85 per cent of the spill.